The Compact Elite X3 - G & W Machinery Sales, Inc. The Compact Elite X3 really is a completely different approach to a galvo system and will change how you do laser marking. The main advantage and feature of the X3 is the working field size and the focused spot size. The X3 has an adjustable marking field of up to 24" x 24" and is capable without a lens change to a spot size as small as 13 um. 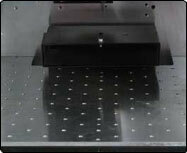 This means you can mark parts without relocating the part or the galvo up to the field size and with a spot size that is 40% smaller than a standard 2 axis galvo system with an F160 optic.